Normally jesters are thought of as brightly-coloured, jolly folks who bring light and joy and jokes everywhere they go. But not this jester! 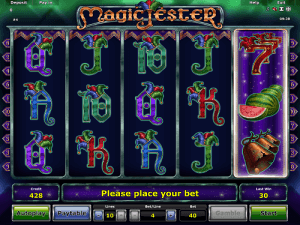 The jester in Magic jester is dark and mysterious, as is the slot game itself. With dark colours like deep purples and greens and blues, this slot game might be dark but it’s incredibly generous. With familiar symbols as well as some extra special features, this slot is not one to be missed. Fans of Dolphin’s Pearl Deluxe, King’s Jester and Just Jewels Deluxe will enjoy this entertaining game. Give it a go and see what this Magic Jester has in store for you! There are many terrific symbols in Magic Jester and most of them are classic slot symbols with a dark twist! The card values from 10 to Ace are all designed in a gothic font and have little jester hats bouncing on the top of them. There are also cherries and watermelons which don’t look very bright but still look tasty and, more importantly, pay out nicely! There is also the red seven and the golden bell which looks to have fallen into disrepair but also still pays out very, very generously! The jester himself also appears on the reels and he can substitute for any other symbol. What a good friend to have on your side! In Magic Jester, the magic starts to happen (and by magic we mean payouts) when you spin three or more matching symbols on an active winline. They need to fall on consecutive reels in order for you to get a payout. When you do get a payout, you can choose to use the classic, double-or-nothing gamble feature which in this game is beautifully designed which makes such a difference to other slots which seem to just give you boring old playing cards and nothing unique! Click on the black or red jester hat – whichever colour you think the next card will be – guess correctly and you’ll double you win but guess incorrectly and you’ll lost it! Like most other NovomaticCasino.co.uk games, you can play for free until you’re ready to play for real and start winning the big bucks! When you’ve got the hang of the game and you feel happy enough with your bet, you can put the game into autoplay mode and let the reels spin themselves and give you wins without you having to keep clicking and clicking! The best feature about this slot game, though, is the Magic Reels! Every spin, at least one reel will become magic and double or triple the symbols which fall on that reel – so the symbols count as two or three of the normal symbol and so if one falls in a winning combination, your payout will increase! What’s more, all 5 reels might fall under the magic spell at the same time, resulting in big wins for you! Magic Jester is just one of the many fantastic slot games which form part of NovomaticCasino.co.uk’s vast collection. We have plenty more great games for you to choose from, including jackpot slots, such as: Mega Moolah and Mega Jackpot. We also have some entertaining and lucrative table games which offer great RTP (return to player) percentages, such as: Sic Bo, Multiball Roulette and Royal Crown 3 Card Brag. Our live dealer games use the latest technology to allow you to play with real dealers at real tables, and get the ‘real casino’ vibe from your very own home. You can choose between: Live Baccarat, Live Blackjack, Live Poker and Live Roulette – and see what Lady Luck’s got in store for you!